Much of the state received less than an inch of rain last month, which led to expanding drought and impacts including multiple wildfires. Click any underlined heading in the graphic to read more about that topic, or scroll down to read our full climate summary. Clear skies and sunshine dominated last month, so with few cloudy or rainy days, it's probably not surprising that our temperatures were above normal. Indeed, the statewide average temperature of 51.18°F ranks as our 40th-warmest November out of the past 122 years. Compared to the rest of the fall, though, November's temperatures were a bit closer to normal after our 11th-warmest September and 13th-warmest October on record. Last month, we didn't see as much strong upper-level ridging over the east coast to feed in warm air from the south. Instead, we spent much of the month in a fairly quiet jet stream pattern with winds out of the west or southwest. The dry weather since Hurricane Matthew has allowed very timely harvesting of crops that were not flooded. The current weather has also created very dry planting conditions for wheat and winter forages. Although some soybeans were damaged from hurricane rains, many are better than expected. Since the weather has been basically rain-free since the hurricane, harvest operations are in full swing. First killing frost 11/13. Soybean harvest coming in with generally very high yields. Yields on Sorghum disappointing, due both to sugarcane aphid and drought and heat at anthesis. Without exception, November was dry in North Carolina. The statewide average precipitation of 1.16 inches ranks as the 12th-driest November on record since 1895. Most of that rain came in the final two days of the month; until then, parts of the Mountains and western Piedmont hadn't seen any significant rain since Hurricane Matthew in early October. At most sites, last month's precipitation values were 2 to 4 inches below normal. That led to more drought expansion, with the worst conditions remaining in the Mountains. Exceptional Drought (D4) conditions have expanded to cover a six-county region in the far western part of the state. Extreme Drought (D3) covers the remainder of the southern Mountains including Asheville. Elsewhere, Charlotte received just 0.94 inches of rain last month. Dry weather there and in surrounding areas saw Moderate Drought (D1) conditions expand into the western Piedmont, while Abnormally Dry (D0) conditions now mostly encompass the rest of the Piedmont, including Raleigh, which reported just 0.60 inches of rain in November. US Drought Monitor maps for North Carolina on November 1 (left) and November 29 (right). The building drought has led to water restrictions being introduced in some areas. A total of 43 public water systems, or 8% of those tracked across the state, have instituted voluntary conservation measures while 12 systems, including Boone, are under mandatory conservation because of the drought. The lack of significant rain is having increasingly serious consequences. While we did have 0.07 inches of rain this week, when added to the 0.17 we've had over the past month, it does not add up to enough. We have had some serious wildfires in the county (thankfully not near enough to endanger us but it did create some very unhealthy air). The pond level has dropped below the outflow for the first time in my memory. All of the small streams are dried up, a few of the larger streams still show a small trickle of water. Little water is flowing in the larger streams or in the upper reaches of the Watauga River. The soil is dried out and we no longer encounter soft patches on the trails in the area. The Christmas trees that are being cut are all showing dried out trunks and will need copious amounts of water as soon as they get taken home. We are seeing white tailed deer on a daily basis and they are grazing for food right up to our cabin. The dogs bark and want to play but the deer are ignoring them while pursuing food. There is a ban on all burning and we are looking forward to some precipitation, hopefully sooner rather than later. Fire risk indices such as the Energy Release Component (ERC), which is related to the available energy from fuels like dead branches and leaves, have steadily increased this fall across the Mountains. Since mid-October, these ERC values have reached new daily highs when compared to data from the past 15 years at sites such as Highlands in Macon County. That extreme fire risk meant November was a busy month for the North Carolina Forest Service and other groups responding to wildfires in the Mountains. The worsening drought combined with the recently fallen leaves made conditions on the ground and in the vegetation like a powder keg, ready to ignite with just a spark. Sadly, in some cases those sparks were supplied by apparent arsonists. All in all, 19 large wildfires were burning in western North Carolina during the past month, including 11 that covered more than 1,000 acres. Among these, the major newsmaker was the Party Rock Fire at Chimney Rock State Park, which consumed 7,142 acres and threatened the towns of Lake Lure and Chimney Rock. With assistance from the Oregon Department of Forestry, this fire was finally 100% contained on November 29 after more than three weeks of burning. 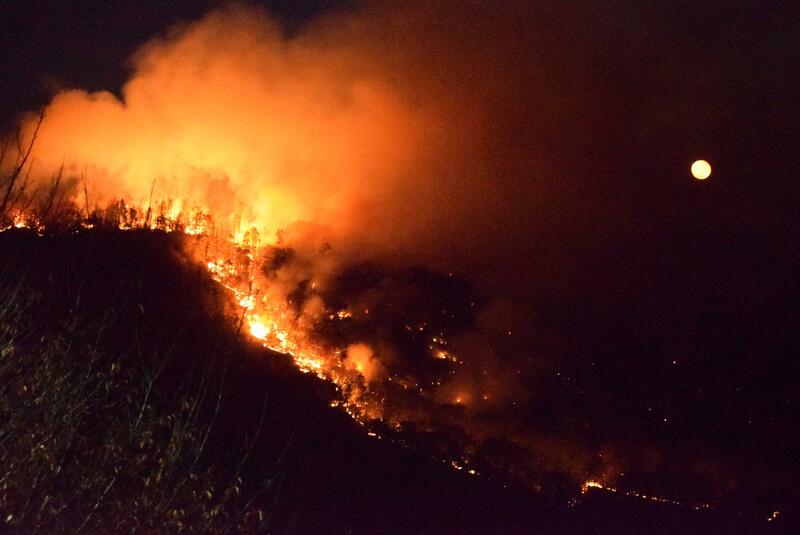 As far as acreage goes, the Tellico Fire in the Nantahala National Forest in Macon and Swain counties has been even larger, burning 13,874 acres so far. As of November 30, the Tellico Fire was 95% contained with 232 total personnel working the incident. Smoke from these fires has had impacts to air quality across the Carolinas. The Mountains spent much of the past month with Code Yellow, Orange, Red, and even Code Purple Air Quality Index values. As the winds shifted and blew the smoke eastward, the Triangle and other parts of central and eastern North Carolina had days with Code Yellow and Orange air quality alerts. While most of the fires are nearing containment and recent rains have helped quench the bone-dry parts of the state, that doesn't mean we're out of the woods just yet. Conditions remain extremely dry, especially in the Mountains, and as our Winter Outlook noted, dry weather is expected to continue through at least the first half of the winter.